Tracking a Turkey: The Quest for an Ethical Thanksgiving. Thanksgiving has always been one of my favourite times of the year. The leaves are changing colour, the air is crisp and clean, and ovens around the country are emanating the sweet scent of roasted turkey. This year, however, things are a little different. Adopting a vegetarian lifestyle has actually been remarkably easy. When you find enough meals that you enjoy and stop focusing on the things you are abstaining from, there is really no difference in lifestyle. Thanksgiving dinner is about a lot more than food though. It is about childhood memories of meals with family, and nothing lets you relive those memories like the smell and taste of turkey. With that in mind, the past few weeks have taken on the feeling of a quest for me - a quest to enjoy a delicious and traditional Thanksgiving dinner without completely disregarding my moral compass. In order to achieve this goal, I needed to address a few issues with respect to eating poultry. First, I wouldn’t eat a bird that lived its life in a windowless shed, stuffed into a cage with no quality of life. Second, I wouldn’t buy a turkey from a company that didn’t let farmers dictate how their own farms were run. Finally, my turkey would have to have as small an environmental impact as possible; meaning it had to be local, and the farm could not be pumping concentrated poultry waste into the environment. Fortunately, I live in the internet age and everything is remarkably easy compared to years past. A quick googling of “family owned turkey farm vancouver” led me to a list of a handful of local farmers who independently own and operate poultry farms. Easy enough. Next, I visited the farms’ respective webpages, reviewed their policies and emailed the ones that seemed most in line with what I was looking for. 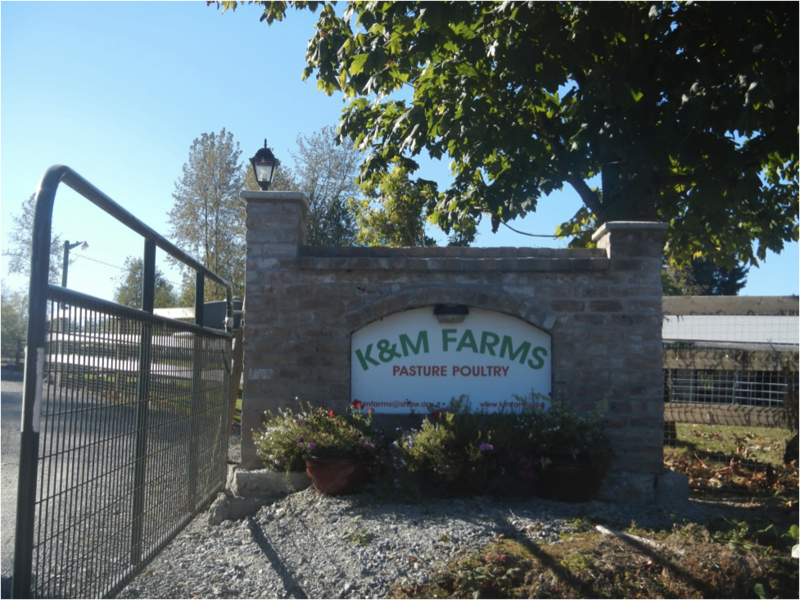 In the end, the farm that stood out was K&M Farms Pasture Raised Poultry. Their birds are raised outdoors on a diet of foraged insects, supplemented by grain. The fact that the birds are allowed to forage was a big plus for me, since growing wheat to feed livestock is one of the most absurd misallocations of resources in the world today. My impression of K&M as a place worth supporting was solidified when I read that they keep llamas to intermix with the turkeys and chickens. The llamas deter eagles from making off with an easy meal. These guys thought of everything. The last step in tracing my dinner from egg to plate was to determine how the birds were slaughtered. Mark, the owner and operator of K&M Farms informed me that all poultry in BC must be processed at a government sanctioned facility. I was hoping that processing could be done at the farm itself, but there isn’t much you can do to circumvent government food regulations. I emailed the company in charge of the slaughter facility and was shocked to receive a same-day reply from Lilydale Inc. Their friendly customer support supervisor asked me about my specific concerns and assured me that I would get all the information I needed. I sent off a list of questions... Unfortunately I never heard back. I did manage to find out that turkeys from K&M Farms would not be intermixed with turkeys from factory farms and that the facility does not use the nauseating liquid bath cleaning procedure used in some places. I also discovered that the slaughterhouse at which my turkey would meet its end was only a ten minute drive from the farm where it was raised. Minimized carbon footprint: check. This morning, my girlfriend and I put the cooler in the car and drove out to Abbotsford to retrieve our bird. We parked the car and were greeted by a llama, a pony, a Siamese cat, and Mark himself, eager to hand over our dinner. It was a strangely novel experience. Rather than going to a grocery store to pay bottom dollar for an anonymous turkey I was standing face to face with the farmer who raised it. The convenience and polished appearance of supermarkets make it all too easy to forget how detached we are from our food. Ask me where the beans I put in my chili came from, and your guess would be as good as mine. The pasta in my cupboard is as mysterious as the Bermuda triangle. Not my turkey, though. I know where it came from, and I know where it has been. That is worth-while and undervalued knowledge. The most surprising part of the whole experience was how easy it was. All I had to do was make a conscious effort. A little thought goes a long way to ensuring your money ends up supporting things you believe in. Sure, it was a little less convenient than grabbing a cheaper turkey at Safeway, but I got to visit a farm today. I pet a llama. In my books, that blows the alternative out of the water. Next week I will go back to being a vegetarian, but I will do so with the knowledge that, every once in a while, if I want to have a traditional holiday meal, I can do so in a way that I can feel good about. The Ocean Receives a (Barely) Passing Grade. Conservation - it's a group effort.